I’ve just opened registration for Mandala Discovery for the January 2014 session. In the lead-up to that, I’m going to offer a few prompts here on the blog that will help you in this transition time between one year and the next. 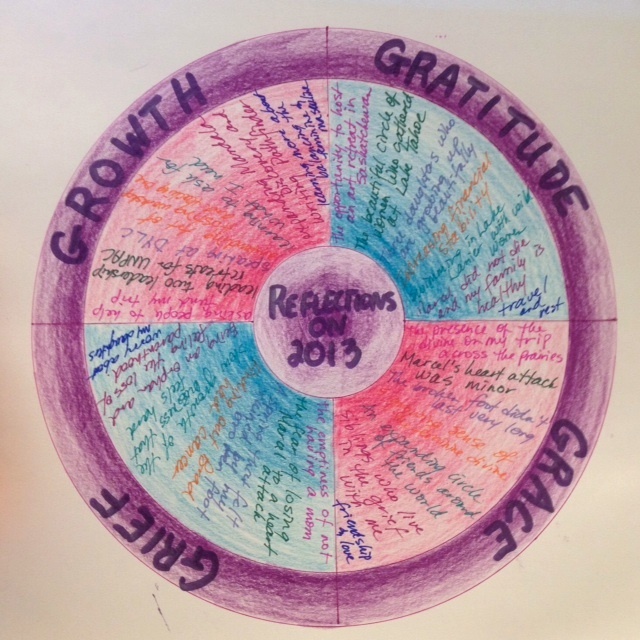 The first mandala is a reflection on 2013. We can’t control the past, nor is it healthy to let it control us. Growth pulls us forward into the future, and if we cling too tightly to the baggage of the past, the weight of it keeps us trapped. That being said… the past has much to teach us, and the most healthy way to honour the past is to reflect on it, ask what it wishes to teach us, and then choose the stories we wish to carry forward. – What do I need to learn from 2013? – What do I wish to release as I move forward into 2014? – What has been offered to me as gifts this year? – What struggles have served as my teachers? To begin your reflection mandala, draw a large circle, with a smaller circle in the centre. In the small circle at the centre, write “Reflections on 2013”. Divide the large circle into 4 quadrants. Choose four words or phrases that will help you reflect on what the past year has been. The words “Grace, Gratitude, Growth, and Grief” worked well for me, because they helped me focus on the struggles and the joy, the learning and the gifts. The four words should have some balance to them, reflecting the positives and the negatives, the shadows and the light. Another suggestion might be the phrases “What made me happy, what made me sad, what stretched me, and what I succeeded in”. Write one of those words or phrases in each of the quadrants. These four quadrants help you see the year as one of balance. Often we get stuck in a certain story for the year. For example, I spent a lot of time in grief this year, having lost my mom just before the end of 2012. I can get lost in that grief and assume that it is the only story of the year, or I can choose to see the grace, gratitude and growth that are also part of the story. That doesn’t diminish the grief or brush it aside, but it gives me hope and purpose that helps me move forward. You may find that one story shows up in multiple quadrants. For example, my husband had a heart attack in 2013, and that showed up in my grief quadrant, but the fact that he is still alive showed up in my gratitude quadrant. After you have filled all of the quadrants, spend some quiet contemplative time colouring the space, honouring the stories that filled your year, and releasing them as you step forward into 2014. You may wish to spend time in meditation or prayer, reflecting on the year and being intentional about what you wish to carry forward. This exercise is now part of A Soulful Year: a mandala workbook for ending one year and welcoming another.